Here is best "ZIMBABWE VS PAKISTAN" ,5th ODI MATCH DREAM 11 PREDICTIONS | ZIM VS PAK DREAM11 TEAM for the Fantasy user ,who venue are looking to make a strong team for maximum win. We are providing latest news, match update, information about the match .The team is picked by using various factors on the basis of performance, ground stats and latest form.
" In a five-match series Pakistan has so far won four matches with big margin.Zimbabwe's team has been quite weak so far, they have lost all the matches with a big margin.Pakistan will want to clean-sweep the series by winning the fifth match. 1- Fakhar Zaman and Imam UL Haq made a record 304 runs partnership in the last match where Imam UL Haq scored 113 runs and Fakhar Zaman scored a magnificent 210*runs(156 balls). 2- For Pakistan,F Zaman is their top scorer with 430 run in this series while Imam Ul Haq had score 285 runs. 3-Shadab Khan bowling superb in the last match and took 4 wicket of ZIM. Faheem Ashraf and U Khan will be crucial for Pakistan. 4-for ZIM, H Masakadza is their top scorer with 98 run while R Murray had scored 61. In bowling , Muzarbani is leading wicket taking bowler. 1-Pakistan team will not make much difference with their winning combination. 2- Zimbabwe also made several changes in the last match, so there may be some major changes in this match too.might bring in C Chibhaba and also look to include some of those player who have been sitting out. 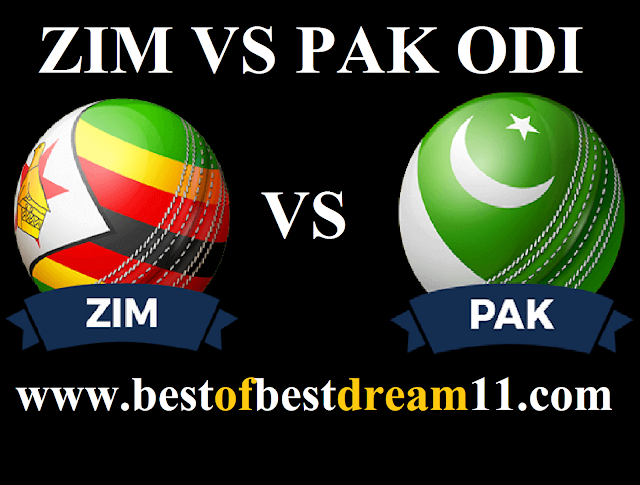 NOTE : stay connected for more ZIM VS PAK team news.